Combining the theme of the 2017 Summer Reading Program with a green thumb in anticipation of their Annual Garden Tour, the Friends Group of Mifflin Community Library is planning an event to engage families and beautify Lancaster Avenue in Shillington. 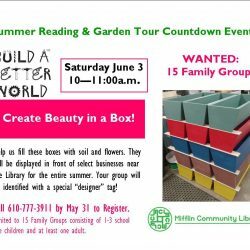 Build a Better World – Create Beauty in a Box will take place on Saturday, June 3 from 10 am to 11 am in the library parking lot at 6 Philadelphia Avenue. Fifteen family groups will plant colorful annuals in handcrafted flower boxes that will be displayed throughout the summer at designated businesses, including M&T Bank, Renninger’s Accounting, Avenue 4 Accessories, Ann’s Nails, the Borough Hall and several others. Family groups consisting of 1 to 3 school-age children and at least one adult must register at the library or by calling 610-777-3911 by May 31. All planting supplies will be provided, and each group will be identified as the creator of their specific box with a handmade garden stake in each. The event is rain or shine. Committee members were met with an overwhelming response to the idea of beautifying the streetscape by the businesses along Lancaster Avenue. Those asked to “adopt a box” were selected for good placement for the planters and visibility fanning out from the library’s central location, and were limited only by the number of boxes available this first year. Participating businesses are asked only to keep the flowers watered throughout the summer to keep them growing beautifully along the avenue. The 2017 Summer Reading Program officially begins on Monday June 12 with a special kick-off event on Friday June 9. The Friends of MCL Annual Garden Tour, that includes six new-to-our-tour beautifully distinct gardens in the Mifflin area, will be held on Saturday, June 24 from 10am to 3pm. Tour tickets are on sale at the Mifflin Community Library and Stein’s Flowers, 32 State Street, Shillington.